Whether you are enrolling a kindergarten student or a high school student, we are here to help you every step of the way. Welcome! We’re delighted you’re considering Lyndon Academy for your family. Right from the start, you and your child will feel the sense of community and dedication to learning that makes us first and foremost a family. The Lyndon Family is focused on the future of all the children who attend. and help make this exciting transition into our college preparatory program as worry-free as possible. We would be happy to arrange an individual visit for you during normal office hours. Contact us at 770-926-0166 to schedule your personal tour. The first step is to schedule a visit. Individual tours and meetings can be scheduled with the Dean of Admission by calling the school. Plan to spend at least an hour and a half at Lyndon on your first visit. The second step is to submit an Admission Application and arrange for a visitation for your child(ren). If applying for Jr. Kindergarten through 6th grade, we recommend scheduling a full-day visitation. The second step is to submit an Admission Application and arrange for a visitation for your child(ren). If applying for Jr. Kindergarten through 6th grade, we recommend scheduling a full-day visitation. This visitation also allows our teachers to observe and learn more about your child, and it provides the administration with time to screen or test each potential student. Learn more about a full-day visitation. For applicants of 7th grade and above, we recommend touring and visiting with future classmates, but only scheduling admission testing is necessary. If you are a foreign non-immigrant student who wishes to apply to Lyndon Academy, please refer to the International Students page. We are excited that you are taking us under strong consideration! The Admissions Committee will consider all applicants at its earliest convenience. Acceptance Letters will be sent out shortly after. The Admissions Committee will consider all applicants at its earliest convenience. Acceptance Letters will be sent out shortly after each meeting. A commitment to Lyndon Academy and deposit are required soon after receipt of the Letter of Acceptance in order to secure a seat. We are excited that you are taking Lyndon Academy under strong consideration! Please feel free to contact us with any questions you have regarding the application process. 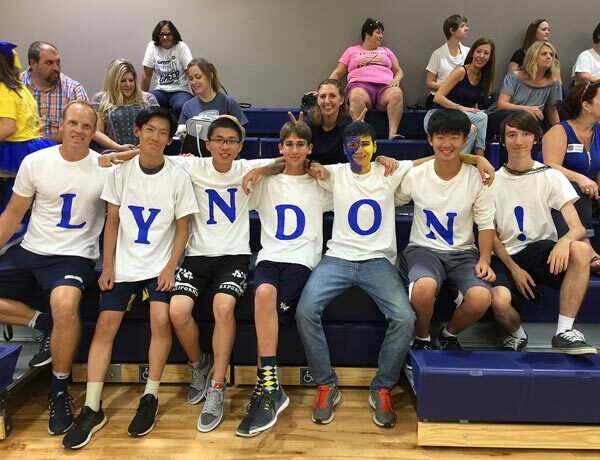 As a private school, Lyndon Academy does not discriminate on the basis of race, color, gender, religion, national, or ethnic origin. New students are accepted based on screening, observation and testing results. Ready to prepare your child for success? At Lyndon Academy we offer a 1st tier private education at affordable prices. Lyndon Academy is competitive when comparing our tuition to other local private schools and it includes books, school supplies, day-time field trips, technology, year book, and food service. Tuition at Lyndon Academy is dependent on the grade level and the chosen tuition payment plan. Payment obligations from the immediate household may be lower than tuition, depending on financial need, scholarships, grants, and discounts applied. We make every effort to craft a plan that works for your household. If you need assistance, please ask. For your convenience, we have provided a financial aid calculator below in the Financial Assistance section of this page. International tuition rates and room & board rates are published on the International Students page. Tuition includes school supplies, day field trips, food service, technology, and year book. Tuition does NOT include uniforms, overnight trips, all musical instruments, athletic participation, some extra-curricular activities, and before and/or after school care. There is a one-time admission application fee of $100.00 per student, and there is an annual deposit required to secure a seat for a coming scholastic year. Deposits are a portion of tuition and are not in addition to tuition. Lyndon Academy accepts credit card payments with the addition of a 2% convenience charge. Lyndon has a rolling admission policy. If students are unable to start at the beginning of the scholastic year, tuition will be prorated. Tuition payment plans are available. Note that they come with added finance charges that range between $400.00 and $1,000.00. Multiple child discounts are also available. Additional financial aid and/or scholarship may also be available. Inquire within the business department for more details about tuition packages, financial aid and scholarship solutions by calling 770-926-0166 or clicking Contact Us. If your household Adjusted Gross Income (AGI) is below $151,000.00, then you may be eligible for financial aid. Enter the grade and AGI in the calculator below to get an estimate of your maximum out-of-pocket expense. Estimates are only for one student. Families with more than one student should inquire within the business department for multi-child estimates. Note that you will need to submit a financial aid form along with your most recent tax returns to the business department to verify and solidify that rate. Also note that the AGI scale is designed for W-2 employees. Further evaluation will be necessary for other circumstances. Lyndon Academy financial aid is a secondary source of financial assistance when nothing else is available. Other sources of funding are primary and may replace some or all of the Lyndon Academy financial aid. We understand that there may be a necessity to help pay for what you desire most for your children. If you need a student loan, you may Apply at Your Tuition Solution. At Lyndon, we understand that providing your children with the very best is not always financial viable. Therefore, we have created a very liberal financial aid package that can be customized to meet your financial needs. Due to a State of Georgia Income Tax Credit Opportunity, students across the state have the opportunity to receive financial assistance. While the Department of Education has approved a variety of Non-profit Student Scholarship Organizations, we encourage our families to look into the opportunities available at GaSSO and Apogee Scholarships. Scholarship opportunities are not limited to these two organizations. If interested in more information about tax credits and scholarship, inquire within the business office at Lyndon Academy. We believe that the only way to truly experience Lyndon Academy is first-hand. That is why we invite all Jr. K through 12th grade applicants to come and spend the day with us. Each visitor is assigned a student ambassador for the day that will be with them every step of the way. This ambassador often becomes their first friend at Lyndon Academy ready to welcome them back when they start school. We would be happy to help you schedule your child’s visitation day at Lyndon Academy at your convenience by calling 770-926-0166. You should make plans for your son or daughter to stay at Lyndon from 8am to 3pm. Keep in mind we are looking for age-appropriate academic ability, motivation, interests, and potential for personal growth. Ready to have a fun day at Lyndon Academy! Upon arrival at the front office, your child will be greeted by administrators of the school and their own Student Ambassador. Your child may wonder “what is a Student Ambassador?” Ambassadors are student peers that provide a friendly and welcoming face to our visitors. They will spend the entire day right next to your child. The Student Ambassador is there to break the ice and help potential new students feel at home. They take new students on a tour and show them the ropes in school, so visitors will get a realistic view of a day in the life of a Lyndon student. These are sought-after posts on an almost daily basis here, and our students feel honored when they are selected to spend the day with your child. There is no need to purchase flash cards and put undue stress on your child. Lyndon is all-inclusive, so you do not need to pack a lunch, snack or book bag. Lyndon Academy is interested in attracting international students who have a high aptitude for learning and a strong desire to advance themselves into a top-tier college or university. As an AdvancEd accredited school with I-20 student VISA status, we can assist foreign non-immigrant students in achieving their dreams. Our partnership with the International University Alliance further assists international students into becoming successful global citizens. IUA participating universities partner with high-caliber secondary schools, like Lyndon Academy, to create connections that bring value to students, to faculty and to their own educational communities. International students benefit from access to a network of the best U.S. universities for international students, expedited and streamlined application processes and visa support for students, the opportunity for transferable credit and advanced standing for qualified students, as well as on campus support for foreign students. Room and board are available for students without guardians in the U.S. We offer students opportunities to live with Host Families within the Lyndon Academy community. Host Families are existing Lyndon families and extensions of Lyndon Academy families that have been screened and checked out by Lyndon Academy. Note that fees exclude extra-curricular & co-curricular activities, uniforms, health insurance, and school transportation fees that may be incurred. The Application Fee is non-refundable. However, the fee does not need to be paid more than once in the event that the Visa has been denied. All foreign non-immigrant students must secure and provide the following in order to process an I-20 Visa with Lyndon Academy. Proof of health insurance. Students can enroll in a health program with Lyndon Academy upon arrival, if they choose. All applicants applying for the F-1 Visa must also pay the I-901 Fee. This fee is paid to the U.S. Government. It can be paid on-line at fmjfee.com. The I-901 fee must be paid, and the family must have the receipt of payment before going to the U.S. Consulate for their interview. The student must have a SEVIS I.D. number (found in the upper right-hand corner of the I-20) before the fee can be paid. For more information visit the SEVIS website at http://www.ice.gov/sevis. Contact Mrs. Linda Murdock, Head of School, at lmurdock@lyndonacademy.org or call 770-926-0166 to ask questions and set up an appointment for an interview. Lyndon Academy will send you the Admission Application and Teacher Recommendation forms. Submit Admission Application and Teacher Recommendations with the rest of the Visa Criteria and pay the Application Fee of $1,000.00. Fees paid to Lyndon Academy may be paid with a credit card. However, a four percent (4%) convenience charge will be added for international cards. We recommend wiring funds to save money. Contact Linda Murdock for payment instructions. Application Fee Due at the time of admission application submission. International Student Fee Due after Visa approval and prior to arrival. Tuition & Other Fees Due at the time of arrival. Lyndon Academy understands that every child has different educational needs, and some students flourish in a homeschool environment over a full-day program. But how do parents of these children handle the educational gaps in the classes they are not able to teach? This is where Lyndon Academy can help. Lyndon Academy can offer a solution to students that wish to experience some of the benefits a larger school provides while still maintaining homeschool status. We are excited to offer a limited number of “a la carte” seats in varying subjects. On July 30th, Lyndon will open seats to students in 1st through 12th grades (based on availability). The current fee for a daily class is $1,800.00 per course per year, billed at $180.00 per month for ten months. Note additional fees may apply for technology, musical instruments, high school text books, testing fees, and transcript processing. The current fee for a class that meets less than five days a week (such as Visual Arts, Performing Arts, Physical Education and other electives) will be pro-rated accordingly. We offer lower and middle school courses in the following subjects: math, science, English, social studies, Spanish, Mandarin, Art, Music, and physical education. Upper school courses are available in the following subjects, but not limited to: Physical Science, Biology, Chemistry, Physics, Algebra I & II, Geometry, Human Geography, Human Geography, World History, World Literature, English 9 & 10, Spanish I, II, III & IV, Mandarin I, II, III & IV, Band, art, music and physical education. For elective and club options, please inquire for more detail. If you are you interested in participating in a sport, then check out our Home School page in the Athletic section of our website. For more information on the Homeschool Programs, please contact us at info@lyndonacademy.org. At Lyndon Academy we believe immersion is the best way to learn. And that holds true if you are considering joining the Lyndon Academy family. That is why we offer tours that allow you to see our students and faculty in action. We want you to immerse yourself in the Lyndon way so that you might get a small taste of the amazing experiences that happen within our walls. Which is smaller, 2 or 12?